Currently when user is redirected to a website outside Salesforce in Lightning, he gets an popup message. "Following this link opens a new browser tab and sends you to a website outside of Salesforce:"
This message don't give good seamless user experience. In some cases user wants to see a bill details of a customer in external application. This message breaks the user journey. Can we have a functionality which can allow us to enable or disable this message? This happens to me all the time, and I get logged out ALL THE TIME. I'm not even leaving salesforce, just trying to open or edit something. 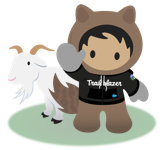 This issue is a major pain because the message appears when trying to navigate throughout Salesforce (not just externally). Trying to open any app, or navigate through Setup, etc... opens everything in a new tab, often without any navigation. Doesn't matter which browser is used, or which computer. Same ugly results constantly. This has become a very annoying issue on Safari in Spring 19 release. It is redirecting me to the login page every other minute. I'm using Safari and the Spring '19 release in Lightning and this issue just started for me. I've checked everything, every setting, no pop-ups are blocked, and can't seem to resolve the issue. Any help/thoughts would be great! Turns out my team had an add blocker called Ghostery on their chrome. Problem was solved once removing this. If yours have something similar it could be worth disabling. Very annoying and I can't seem to find a work around or fix. Is there a fix for this for Chrome? I've tried allowing my URL, and not having any luck. Looks like, they are going to fix this in Spring 19 Release. You are exiting *********.cs80.force.com. Continue? I started getting this in Lightning Spring 19 in Chrome. Very very annoying.. I even allowed Pop-ups and redirects but no luck. Getting below error message when trying to navigate through Setup in Lightning. "We'd like to open the salesforce page, in a new tab, Because your browser settings, we need your permission first"
Did you find a solution for Chrome ? If I click on "Open" nothing happens. I resolved this by going to Safari > Preference > Privacy > uncheck Prevent sross-site tracking. I forget if this is enabled by default in Safari, but I'm no longer experiencing this issue. As of last week, I'm getting this error all the time while using setup in both Chrome and Safari. Is there a known issue record that anyone has found?